Shell EP International has acquired a 25 percent interest in the Inam offshore block. The share was bought from two former Inam shareholders - LASMO, a U.K. oil exploration and production company, and Russia's Central Fuel Caspian Sea Ltd, which both held 12.5% interests in the project. This is the first project that Shell has signed with Azerbaijan. Shell's representative in Baku is Mr. Rejep Aksulu. LASMO's share was acquired when they bought out the British company, Monument Oil and Gas, an original shareholder of the Inam project. The transaction was completed March 9, 2000 and cost Shell approximately $36 million. The Exploration, Development and Production Sharing Agreement for the field was originally signed in London July 21, 1998. 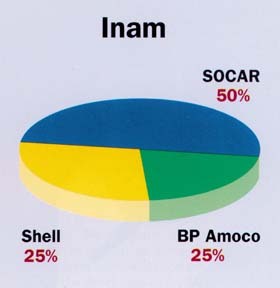 The remaining shares belong to BP Amoco (25%) and SOCAR (50%). The Inam block, operated by BP Amoco, is located approximately 160 km south of Baku in water depths of 30 to 100 meters. SOCAR experts believe that the 225 sq km concession may contain 1.4 billion barrels (more than 190 million metric tons) in recoverable reserves of oil. The partners in the project are jointly committed to 3D seismic acquisition over the license area and the drilling of two firm exploration wells. Shell's share of the exploration costs are anticipated to be $30 to $50 million. To date, approximately 538 sq km of 3D seismic data have been acquired, and preparations are underway for the drilling of the first well, which is anticipated to spud during the third quarter of 2000.